They all have clear acrylic brochure retainers to that your literature gets maximum exposure. These stylish literature dispensers are ideal for libraries, reception areas and schools. 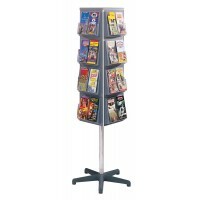 Ditch your dull display units and opt for a snazzy freestanding A4 literature dispenser instead. A perfect focal point, they’re an ideal marketing accessory for any showroom, reception area or trade show event when you need to communicate your marketing effectively. The eye-catching freestanding unit is constructed with a sturdy metallic base stands so is great for withstanding knocks in crowded settings. What’s more, the dispenser unit is constructed from robust wood from sustainable sources so its kinder to the environment. A popular product, its perfect for a range of busy settings such as reception areas, libraries, retail showrooms or simply to accessorise your trade show exhibition stand. 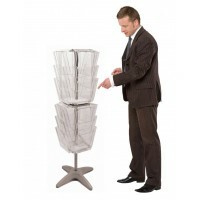 Now you can benefit from secure A4 literature storage that is easy to spot in crowded settings. With a clear acrylic pocket, brand logos and graphics can be easily seen and a generous pocket depth of 20mm cuts down on literature replenishment. Available in a range of soft pastel colours, you too can enjoy more stylish storage for your catalogues, leaflets or print marketing. Give it a go!